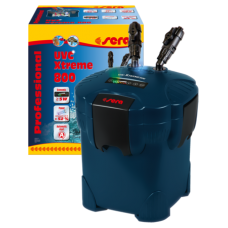 the sera uvc-Xtreme, available in the 800 and 1200 versions, are efficient and energy saving external filters of the newest generation. Due to the integrated UV-clamp with amalgam, their lifespan extends by up to 42% and their performance by more than 52% compared to standard uv-c. Up to 93% of pathogens and algae in the aquarium are removed. The electronically dimmable performance can be adjusted to the requirements and is therefore particularly energy saving, a high pump performance is already achieved at 5 w.
Due to permanent de-aeration and current optimization, the external filter is also particularly quiet. With only 24-volt dc supply, it is furthermore also particularly safe. The automatic suction pump de-aerates the filter upon pushing a button. There is no need for manual suction or pumping by hand.